A plain but boldly designed gold cross pendant echoes the call for Christians set out in 1 Corinthians 10:31: "So whether you eat or drink or whatever you do, do it all for the glory of God." This simple, small cross pendant will be a forever reminder of this call. Crafted of 14K white gold for a clean style, the cross features an open design which is essentially a silhouette of the cross. The thick edge of the cross is plainly polished for simple, elegant beauty that beckons you to remember to glorify God in all things. 13.5mm x 9.5mm (Over 1/2" x 3/8"). 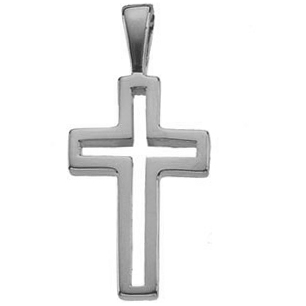 We guarantee our 14K White Gold Small Cut-Out Cross Pendant to be high quality, authentic jewelry, as described above.